Toby Huddlestone’s critique is presented in the form of photographs from his ongoing series, ‘Actions in Galleries’. Printed in black and white, they are collaged together in such a way as to reconstruct the gallery spaces. Toby is photographed behaving in a variety of somewhat unconventional ways in relation to the original artworks. For example, he is photographed ‘Almost writing on a Cy Twombly’, doing a handstand in front of an inverted image of a tree….. or mimicking the climbing of a ladder before a Donald Judd.Reactions to the work at the PV were on the whole of amusement, laughing out loud and wry smiles. I was one of the few, or maybe the only person, to be unamused. This disparity of response bothered me. I was getting it wrong. But amusement and irritation are in this case non-identical twins. And I was a little surprised at the manner in which they returned me to the work. Humour and irritation are siblings subject to the same institutional controls. The work might prefer humour, but the result can be reached by any route. Its value lies in its capacity to deflate the pompous as well as to subvert through humour. Taken at face value, the antics are those of mild misbehaviour in a public place. The kind of thing that might occur in a light-hearted and relatively unconsidered way, but which becomes tiresome after a while. But face value is a disguise. In related vein, Pavilion is an art-architecture collaboration between artist Gabriel Birch and architect Sophie Yetton. 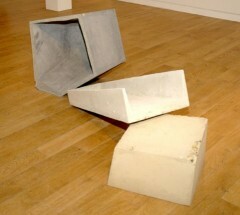 As with Toby Huddlestone’s work Gabriel Birch’s sculpture is intended to be more than meets the eye, or in its alter-incarnation as a seat, to insist upon more than face value. This too questions our propriety, encouraging a behavioural rethink which creates fault lines in our preconceptions. I was taken back to my post-war housing estate, as it was, in construction around us. There were endless possibilities for play in the building materials stacked here and there. Bricks, ceramic pipe, concrete sewer sections, all were at the mercy of childrens’ imaginations. ‘Pavilion is looking to develop a performative gallery architecture that initiates new relationships between the viewer, the art work and the gallery itself’There is an element of playfulness in this austere concrete? I imagine a small child sliding down its inclinations without a care in the world. ’45 Monkey Puzzle Trees of Kent’, a work still in progress, the number growing, has a front cover drawn in the innocent manner of a child making a scrapbook. The photographs in this work are donated, like the lines in #collectedpoem and also in similar vein, look back in somewhat nostalgic fashion. My grandmother pointed out to me, with a sense of delight in discovery, the first monkeypuzzle tree that I saw. The name was intriguing, and the tree itself has since had an impact upon me whenever I come across one. This first tree was in the front garden of a redbrick Victorian house and may well be there still. Monkeypuzzles were not to be seen in our postwar housing estate and I associated them with a genteel ambience.The tree has for me an aura of lower middle-class stability. Slow to mature, strong in their own defence, prickly and unflinching, a mixture of strength, determination, pride, and certainty in their own being, which is tinged with self-consciousness. There is too, sufficient English eccentricity in their lives far from Chile to suggest the presence of their owners’ Toby Huddlestone inclinations. The publication offers a no-arty-nonsense-aesthetic, images of this tree here, that tree there – be wary of face values. Diane Dever’s work, ‘Lighthouse Relay’ from the Folkestone Fringe, is an ongoing sound piece curated by her from the work thus far of 14 artists each of whom chose a lighthouse upon which to base a sound ‘Relay’ ‘The 14 individual transmissions respond to Gugliemo Marconi’s pioneering experiments with radio transmissions in Dungeness and at the South Foreland Lighthouse on Kent’s southern coast.’ Each artist made sound recordings reflecting their own individual interests, and passed the work to the next, who made a new piece incorporating their own recordings and the work received from the previous (lighthouse) site. The final piece is 28 minutes of recordings. Unsurprisingly there is a strongly felt connection to the sea in the work(s), evocative ringings and crashings, surf on stony beaches, and foghorns. Electricity crackles as though from wet pylons on a misty morning. Fittingly too there are sounds reminiscent of the tuning noises when turning the knob which drove the string which carried the station indicator of the valve radio that once meant so much to all of us. Dan Simpson’s crowdsourced material (from paticipants invited via Twitter) for #collectedpoem melds together disparate lines contributed by ….people, via the first person singular, on the theme of collecting. His entertaining performance at the preview made connections, conjunctions and contrasts that generated new meanings to the their disparate contributors; that the casual visitor will be able only to read his/the piece throws up a difficulty which is to a degree solved by You tube and Vimeo. His notion that he acted as curator adds light to the curating role, in a time of flux with regard to the nature of curation. (The term has become somewhat trendy perhaps – the new name for a spade?) Curator as parent and midwife, (pro) creator and deliverer. Ruth Geldard’s three pieces begin with verbs – ‘To smother’ ‘To Heal’ ‘To Secrete’ My male gaze lacks confidence here. To Smother? Smothering? (S)mothering? My mother? Smother the mother? Smothering is a gentle art, but oh so insistent. Brings back memories.From a distance ‘To Smother’ is an over sized confection on the wall. 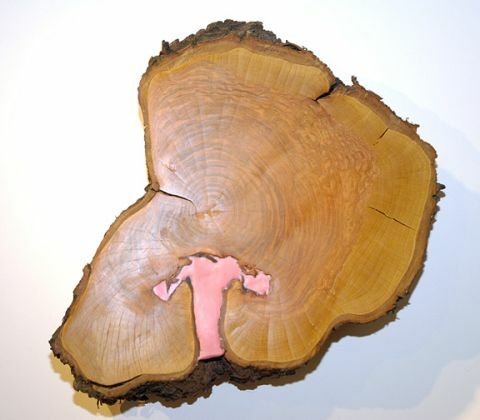 Get closer and it has the appearance of a section of tree-trunk overwhelmed by sweet pinkness, its enamel surface a contradiction. Invited by the artist to touch the work, my visual enamel is shattered by the shocking sensation of clammy skin. First reactions are of eye and hand reading different stories, but second thoughts suggest that the differences live through their associations. The eye touches more easily than the hand? My male gaze backs off a little.Female, Feminine, The feminine ephemeral, the female timeless, ‘To Heal’ is an intervention of pink wax in an ovarian fold in what seems like Yew. The pink is feminine, the ovaries female, their splintery edges threatening ectopic separation. ‘To Secrete’ is made from love letters em-bedded in another section of Yew. Rolled and folded, are her letters pink, and his blue? White ones carry less anticipation. Is this an innocent secrecy? The whispering grass might know. Angus Pryor is having a good time having a bad time, or having a bad time having a good time? His diptych ‘God and Man’ has the possibilities of both. Maybe it’s a tidal process. A painting that does not want to stop, in this relatively small gallery, it is surprisingly unobtrusive given its size – 2.4m x 4.8m. This is a graffiti-wall of a painting combined with recycling centre. A mass of detail, minus details, its imagery in the form of, well it’s hard to see – not despite the fact, but because it is all there in front of you. 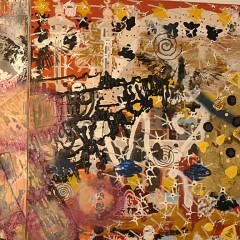 What appear to be the upper halves of plastic objects such as a mice, plastic toy bats, small masks, are held to the canvas by thick paint which has been poured over them in the manner of a small child delightedly icing a bun. Mouse and bun just about survive. Dobs and blobs, chocolate icing in spiral form. Elsewhere, the image of a bird, as it were, impacted in flight onto the painting, and futher on, a real feather. Houses, lanterns, Stars of David, a bit of fluffy material ‘collected’ by the paint when wet. The visceral pleasure in surface and ooze is not completely sure of itself. Abjection is just around the corner.